Calcio fiorentino (also known as calcio storico "historic football") is an early form of football that originated in 16th-century Italy. Once widely played, the sport is thought to have originated in the Piazza Santa Croce in Florence. Here it became known as the giuoco del calcio fiorentino ("Florentine kick game") or simply calcio; which is now also the name for association football in the Italian language. The game may have started as a revival of the Roman sport of harpastum. Calcio was reserved for rich aristocrats who played every night between Epiphany and Lent. Even popes, such as Clement VII, Leo XI and Urban VIII were known to play the sport in Vatican City. The games were known to get violent as teams vied with each other to score goals. In a historically famous occasion, the city of Florence held a match on February 17, 1530, in defiance of the imperial troops sent by Charles V, as the city was under siege. In 1574 Henry III of France attended a game of "bridge fighting" – put on in his honour during a visit to Venice; the king is recorded as saying: "Too small to be a real war and too cruel to be a game". Over the centuries, there have been numerous sources that testify to the presence of the Calcio Storico Fiorentino as early as the 15th century. The Florentines usually found themselves in the streets of the city or in the main squares starting matches like the ones you can see today during the re-enactment. The occupation of public spaces by young people was regulated, later, to avoid disturbances and problems in the organisation of the city; in this way the squares became the officially designated places to play football. The balls were often handmade with the outside made of leather and the interior filled with rags or sometimes with animal bladders filled with air. Throughout the Medici age, what had been a popular pastime was reorganised and became a discipline practiced by the noble classes. Florence began to be the scene of numerous clashes between the people, often divided into teams, and headed by the most illustrious personalities of the Florentine families. The noble character gave rise to the term of Football in Livery, referring to the livery and elegant clothes worn by the players. The official rules of calcio were published for the first time in 1580 by Giovanni de' Bardi, a Florentine count. 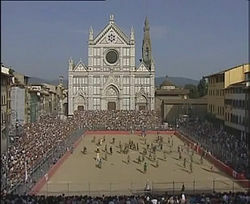 The period designated for the games was generally that of Carnival; the famous game on 17th February 1530 in particular went down in history, when Florence was besieged by the army of Charles V. The Florentines, despite the seriousness of the situation, started nonetheless the Calcio Florentino game in Piazza Santa Croce! The Calcio Storico Fiorentino players could, therefore, take revenge on those nobles who lived the game as an aesthetic moment in which to show off their precious clothes thereby losing the recreational and authentic aspect from which this street sport was born. The citizens of the aristocratic families, in fact, organised the games in the most important parts of Florence and added that a procession in honour of the race. Residents were invited to attend as spectators to watch from the stands built around the city square. All the districts of the Calcio Storico Fiorentino participate in the parade, although the final only includes two teams. Matches last 50 minutes and are played on a field covered in sand, twice as long as it is wide ( approximately 80x40 meters ). A white line divides the field into two identical squares, and a goal net runs the width of each end. Each team has 27 players and no substitutions are allowed for injured or expelled players. The teams are made up of four Datori indietro (goalkeepers), 3 Datori innanzi (fullbacks), 5 Sconciatori (halfbacks), 15 Innanzi o Corridori (forwards). The Captain and Standard Bearer's tent sits at the centre of the goal net. They do not actively participate in the game, but can organise their teams and sometimes act as referees, mainly to calm down their players or to stop fights. 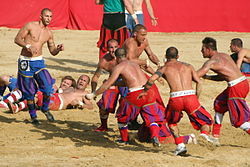 The game starts when the Pallaio throws and kicks the ball towards the centre line, then at the first whistle and at first the ball rests on field, 15 forwards or Corridori begin fighting in a wild mixed martial arts match- punching, kicking, tripping, hacking, tackling, and wrestling with each other in an effort designed to tire opponents' defences, but which often descends into an all-out brawl, trying to put, pin down, force to submit as many players possible; once there are enough incapacitated players, the other teammates come and swoop up the ball and head to the goal. Then followed by a small cannon firing; the shot announces the beginning of the contest. From this moment on, the players try by any means necessary to get the ball into the opponents' goal also called caccia. The teams change sides with every caccia or goal scored. It's important to shoot with precision, because every time a player throws or kicks the ball above the net, the opposing team is awarded with half a caccia. The game ends after 50 minutes and the team which scored the most cacce wins. The prize is also interesting, because along with the Palio di Siena, the winning team used to receive a Chianina, a type of cow. However, the prize has been reduced to a free dinner for the winning team; the players earn no other compensation. More popular than ever, Calcio Storico Fiorentino has kept the form of a historical event amongst the most important ones of the city and region.